Ok let me begin by being honest - I am not a bread person. To clarify, I could eat loads of it but unless I can make a loaf in my bread machine, I rarely dabble in bread making. Main reason? Kneading. Blech. I get no joy out of manual labor. Sure, I could use the knead cycle of my bread maker but I rarely do. Then I became the owner of a KitchenAid mixer with a dough hook. I haven't looked back since. It is the best thing next to sliced bread, no pun intended. Which brings me to the recipe I am sharing with you today for a sinfully good White Rustic Loaf. The crust is golden brown, crispy and somewhat chewy. The inside is like biting into a cloud. Serve warm with a pad of butter and some top-notch jam and you will grin from ear to ear. And trust me, you will come back to this recipe time and time again. Seriously, it is that good. This recipe comes from all away across the pond - England. As many of you know, I am a huge fan of British baking. I cannot get enough of it. I collect British cookbooks, surf the web for Brit baking...anything I can get my hands on is filed away for later use. 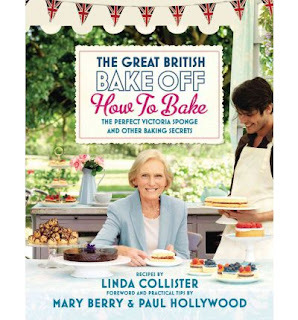 There is one cookbook in particular that I absolutely adore titled The Great British Bake Off - How to Bake The Perfect Victoria Sponge and Other Baking Secrets. It is the end-result of Season 2 of The Great British Bake-Off, a UK-based TV show that pits baker against baker. Though I have yet to see an episode as we don't get it here in Canada, I am addicted to the cookbooks. I have made several recipes from this book but the most recent one is the one I am sharing with you today. Not being the most skilled in bread-making, I am still in shock over how incredible this bread is and with such little effort too! You must give it a try. STIR with dough hook on lowest speed for 6 minutes. POUR 1 cup of hot water into the pan you placed on the lowest rack of the oven. This will create a burst of steam that will help get that crispy crust we all adore. LET cool to almost room temperature before slicing with a serrated bread knife. I have FOUND you! How lovely to meet you and your gorgeous blog due to your comment on mine! I have now added you to my bog roll and I shall be a regular visitor here! OH YES! I have that book and I LOVE it, and, your bread looks DIVINE too! Lovely to have you here! And many thanks for the sweet compliments and the addition to your blog roll !!! This bread looks amazing and you make it seem so easy. I swear I have messed up bread with my kitchen aid dough hook lol maybe it's the part where I physically have to touch the bread myself that I ruin. I will have to try this as I would love to make my own bread. Wonderful bread!! Can't wait to try it myself. Thanks for sharing your recipe!! Your description of this bread makes me drool. You are right about the manual labor part - hurts my arms just thinking about it! The finished product looks GREAT! Pinned! Thanks for sharing at Dwell on Friday! Ummmmm....this is so going to be tried this weekend! Need to convert grams and ml but not a problem! Thanks for sharing ... PINNED! I agree, this is a perfect white loaf. It just looks amazing and sure wish I was having a slice right now! Hope you are having a great week end and thank you so much for sharing with Full Plate Thursday. This looks incredible. I want to make some right now! Thanks for sharing at oopsey daisy! Your recipe is featured on Full Plate Thursday this week. Hope you have a great St. Patrick's Day week end and enjoy your new Red Plate. There is no sugar in this wow all the bread I ever make always use honey or sugar I will try this out. How important is the sea salt in this recipe I only have table salt here? I love my new kitchenaide stand mixer the first time I made bread with the bread hook it was on a completely different level than hand kneading or the bread machine. I'm in the US my friend showed me your blog and I love looking at your new sweets it is worth having to convert everything lol. Hi Dawn, regular table salt is fine. Would love to hear how you like the bread !